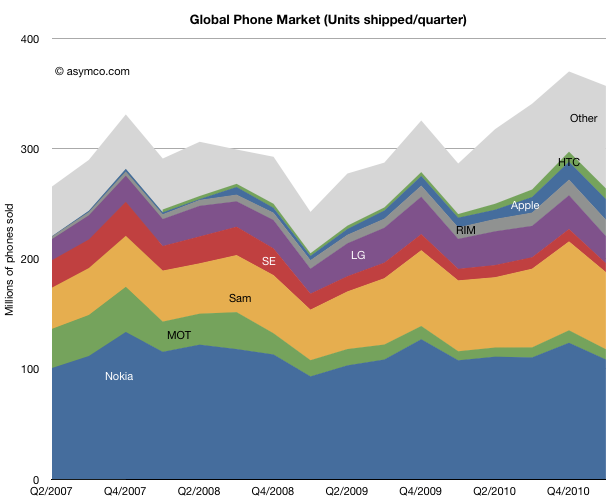 It’s time to review the mobile phone market at the end of the first quarter of 2011. Before I begin, I’d like to remind that this analysis will span multiple posts and that many details will be published separately due to time and space constraints. 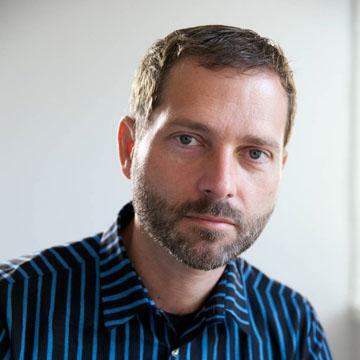 Data about platforms, sales, profitability and pricing will be posted separately. All data sets and chart data will be available for interaction and download through Asymco Interactive when complete. You can purchase a license to Asymco Interactive anytime and you will have access to any new data sets for next 90 days so don’t hesitate to pre-order the report. To give an idea of the split between smart and non smart, Nokia’s smart business grew at 18% compounded while its non-smart units contracted at -6% rate. 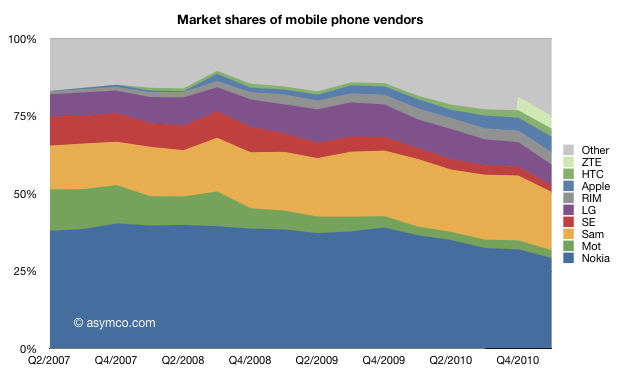 In terms of market share, the field is becoming more crowded. The ranking of units shows a continuing relegation of Sony Ericsson and the increase of HTC to 7th spot. Apple reclaimed its fourth spot from ZTE. 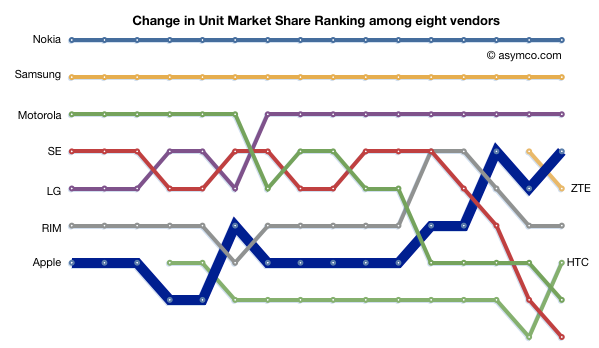 As the number of vendors increases and the share of incumbents decreases it becomes harder to identify who is a “top tier” vendor or, in fact, what the tiers are. It’s pretty clear that on a unit basis there are nine vendors selling significant volumes. The other important observation is that vendors like ZTE are graduating from “other” while “other” is still growing, now at 25% of the market.